Better late than never for last week's DPW Challenge. I think Pt. Lobos may be the most beautiful spot on the California Coast. 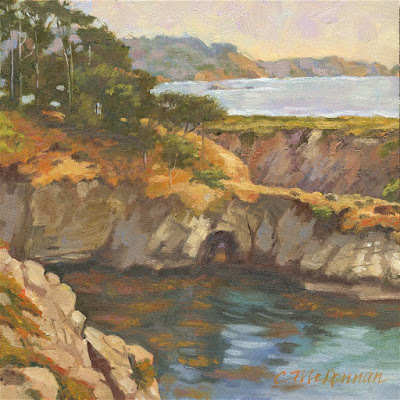 I painted this shot several years ago, from a photo I took many years ago at Craig Nelson's Asilomar workshop. I have improved significantly, I think. Sadly, more understanding and experience did not make it much easier. Knowing more equals higher expectations and more pointed comments from the inner critic. My earlier effort, which sold some time ago and now appalls me, is here. At least I have corrected the too-dark shadows of the reference photo (and present in most photos), separated the background, and done a bit better with the color.